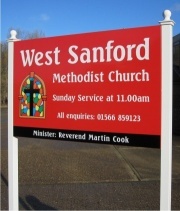 Post Mounted Church Signs: We supply a wide range of post mounted church signs. Using either 3mm (11 guage) aluminium sheet or Aluminium Composite Material (ACM) we can profile cut virtually any shape or size to suit your particular requirements. 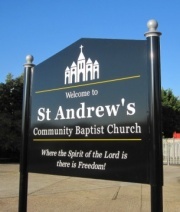 Our church signs will last for many years and enhance the image of your place of worship. 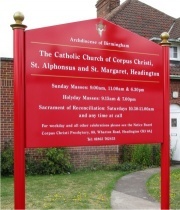 To date we have supplied signs to over 2,000 churches and places of worship across the UK and on our website we have tried to show you just a small sample of what we can offer. 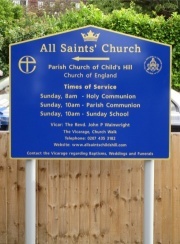 From flat plate aluminium composite church signs on a single aluminium post through to a bespoke custom made aluminium church signs we have the manufacturing experience to fabricate church signs for all locations. We offer a powder coating service where aluminium posts can be powder coated to match the sign face. Often in churches there can be obstructions where you would like to site your new church sign. In such instances we can also offer aluminium posts up to 6,000mm in length. As always we offer our Free No Obligation design and quotation service which enables you to see exactly what your proposed new church sign will look like as well as how much it will cost before you place your order.